View the full range of accessories & kits. Joolca’s sturdy Ensuite Double shower tent is a bit like a ship in a bottle; it looks impossible, but it pops up in seconds! What emerges is a two-room en suite, complete with shower space, separate dry changing room, windows, drainage, ventilation, valuables compartment, toiletries organiser, removable laundry hamper and interior as well as exterior towel lines. Your Joolca order comes with free domestic shipping. If you need to return your item it won't cost you a thing, either! We'll provide you with a return shipping label. Your Joolca order comes with a 30-day trial. Use your new products out in the field and return anything you're not happy with to us within 30 days for a full refund. We pay the return shipping, too! All orders are dispatched daily Monday to Friday from our Melbourne warehouse. Order before 11AM AEST and we'll send your order out on the same day! Hard to believe, isn’t it? But the Ensuite really does pop up in less than 30 seconds. Check out the video and see for yourself. There’s an added finesse in that no hard parts can get stuck sideways inside the tent frame when you collapse it. So packing up your Ensuite is just as quick as pitching it. 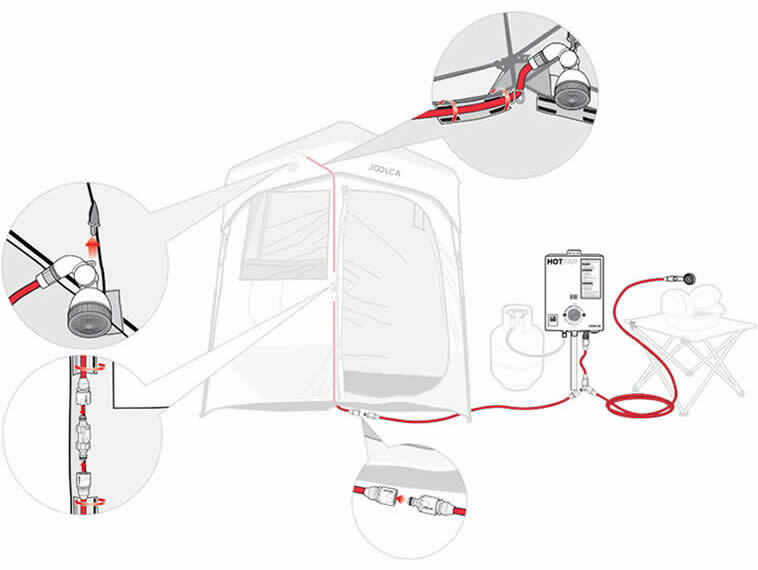 Designed for use with Joolca equipment, the Ensuite works equally well with your own setup. Simply feed the shower hose through the opening by the floor and secure it at a convenient height with the integrated clips. And if you’d like one-touch control of the hot water, pick up a HOTTAP to go with the tent. Thanks to the silver-coated fabric, you are afforded absolute privacy. Not even the silhouette of occupants is visible from the outside. Want to keep an eye on the campfire whilst getting ready for dinner? Simply zip the large fly-screen windows open (there are no less than three of them). At 210cm (H) x 200cm (W) x 110cm (D), the Ensuite Double gives you plenty of room to move. Lather up, get changed and help the little ones without having your style cramped. There’s a separate utility room, with doors to the shower space and outside. Apart from offering a great space for changing, this is perfect for drying camping gear. In the shower space, there’s a large wall organiser for toiletries and a mesh pocket for valuables at the ceiling. The dry room sports a removable laundry hamper as well as a towel line. And for good measure, there’s a towel line on the outside of the tent, too. Everything in its place. A mesh drain and two zippered fly-screen roof vents ensure that the water and steam has somewhere to go. Steel poles and a dome lock in ABS make for a stable tent that will last for many years, come rain, hail or shine. To ensure super-quick pitching and packing, we have not included a fly. Instead, the Ensuite Double comes with a solid waterproof roof that affords more than enough protection from the elements. The Ensuite Double is ready for the addition of an exterior open-plan kitchen or wash-up space. Just check out the optional Ensuite Double Awning for inspiration. Stable when freestanding, the Ensuite Double still includes tie-downs and pegs for those windy days. Plenty of thought has gone into every little detail. That why, when left open, you can keep the doors and windows as well as the roof vent covers out of the way with little tabbed belts. Quick & easy to set up & pack away. Love the new colour as it blends into the Bush a lot better. Plenty of Windows, roof vents & hangy thingies to put stuff in. Used my new Joolca Double Ensuite tent for a recent overnighter and I am very pleased. I only used it for the toilet and it felt roomy and spacious. It was so easy to put up. The interior was cool in the heat of the day with the plentiful window options. When closed up for the evening, it remained completely dry inside, while the dew outside was extensive, very much unlike my previous popup. Plenty of pocket options to put things, and places to hang things. I was able to pull it down and bag it up without assistance. I am looking forward to testing it out with the shower next. Very easy set up and pack up. Good room and handy features. Large windows for air flow and good storage for towel, shampoo etc. On first use I found a small hole in material and used supplied patch to mend. Built quality seems good, only time will tell. Great product for camping. I would buy again. Miles in front of the competitors! I have used other ensuites that claim to be the same as the Joolca. They don't come close in quality or finish. The Joolca Double Ensuite Tent fabric is thick, the zippers are smooth, nothing gets caught or tangled (The padded knuckles on the folding legs are a great idea) I'm super impressed with this ensuite! The new charcoal grey colour is great too, very classy. I love that there is no roof to put over the top. 1 person can casually grab the storage bag and have this up and ready to shower in about 2 minutes (the same goes for pack up, very easy and fits back into the bag well.) I have recommended to others, this is a great quality bit of gear. Will be tagging Joolca in our travels! We love our Ensuite tent. It is so easy to put up and down (easy enough that it has become my job to do it each camp trip) My only comment would be to make it a little larger, once you get a portaloo in the entry side there isn't alot of room to manoeuvre around it to get in and out of the shower side.